First course – Beet-Honey-Orange, inspired by “Honey Is Sweeter Than Blood” – Beets, vinegrette, beet sorbet, a very thin brioche crouton, micro greens, and candied orange zest. Very acidic. The miracle berry was interesting – it didn’t quite make anything taste super sweet, but the lemon was like a cross between a grapefruit and a tart lemonade, which is fun. It wasn’t really a moreish dish, but it was cool. 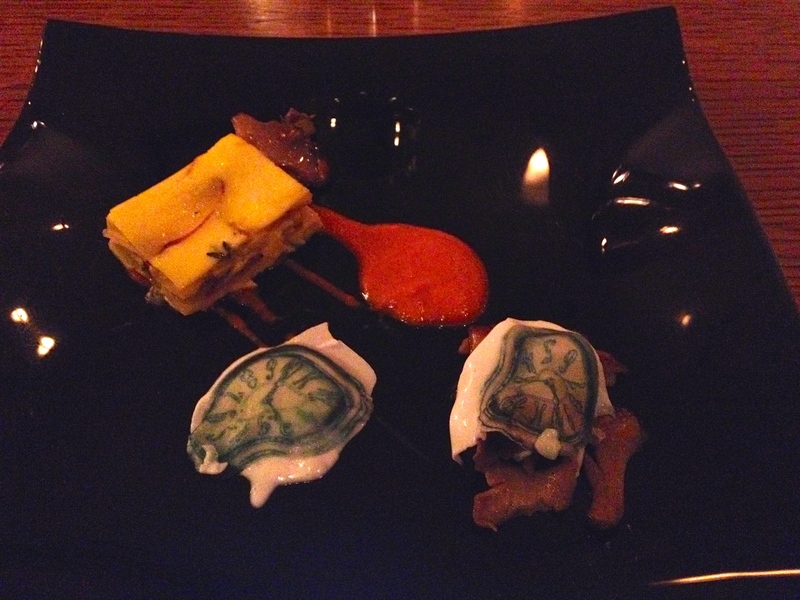 Second course – Sofrito-Goat Milk-Espange, inspired by “Persistence Of Memory” – Tortilla España with saffron. I think they may have mentioned a goat cheese creme fraiche and panna cotta, as well as maitake mushrooms. The tortilla was warm and very tender, almost more custard than potato, and I could taste the saffron. The mushrooms were a little cold. I think there was garlic in the creme fraiche. The red pepper sauce was a little one dimensional. I think they focused more on presentation than taste, to be frank. 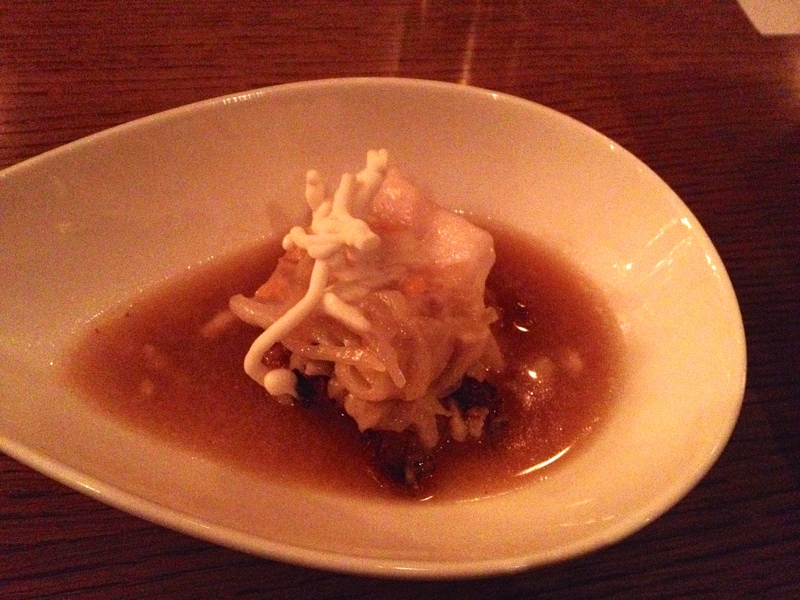 Third course – Romesco-Potato-Cobia, inspired by “Tuna Fishing” – Potato croquette, caramelized onion broth, romesco, cobia, some kind of frozen onion. The fish seemed almost like an afterthought. The potato cake, however, was delicious – creamy and flavorful, with lovely crispy bits. The broth was nice, and although the frozen onion thing melted quickly, it added a nice creaminess. This was my favorite dish of the night, but I wasn’t especially wowed by any of the other dishes. Fourth course – Brioche-Pistachio-Apricot, inspired by “Architectonic Angelus” – Candied apricots, cherry sauce, nougat over brioche fluff, pistachios over pistachio sauce. This was quite difficult to eat. Furthermore, it seemed more like a selection of disparate items on a plate, not a full plated dessert. 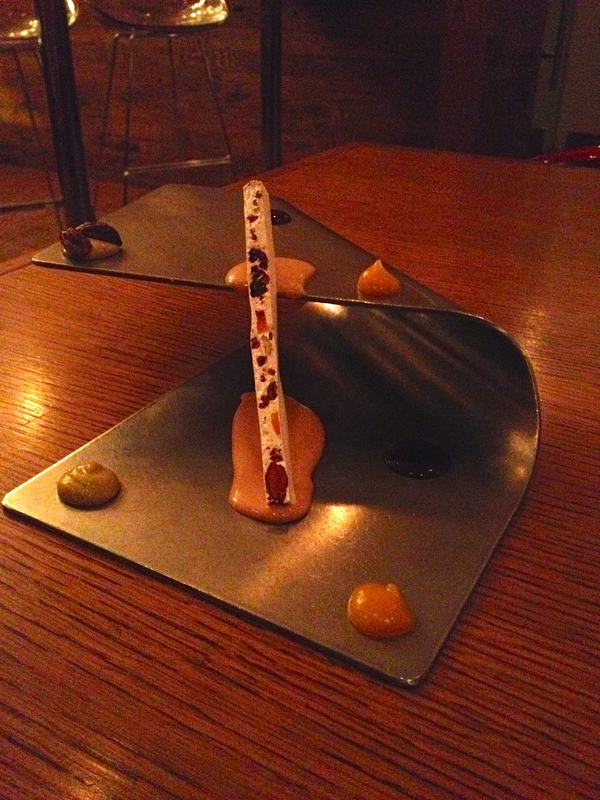 Actually, it seemed more like random spots of sauces than a dessert at all. I suppose that it was interesting, and the nougat was good. None of the dishes was very easy to eat, the last course least of all. I was more impressed by creativity than flavors with the first two courses, but I liked both for the third. I do, however, see why people complain about having to eat more elsewhere after this kind of restaurant. They were by far the smallest dishes I’ve had – as though they simply plucked a few courses from their main ten course menu without any thought to the fact that it was supposed to comprise a full meal. It was probably the most inventive food/plating I’ve had, although possibly creativity for the sake of creativity, which isn’t a good idea. 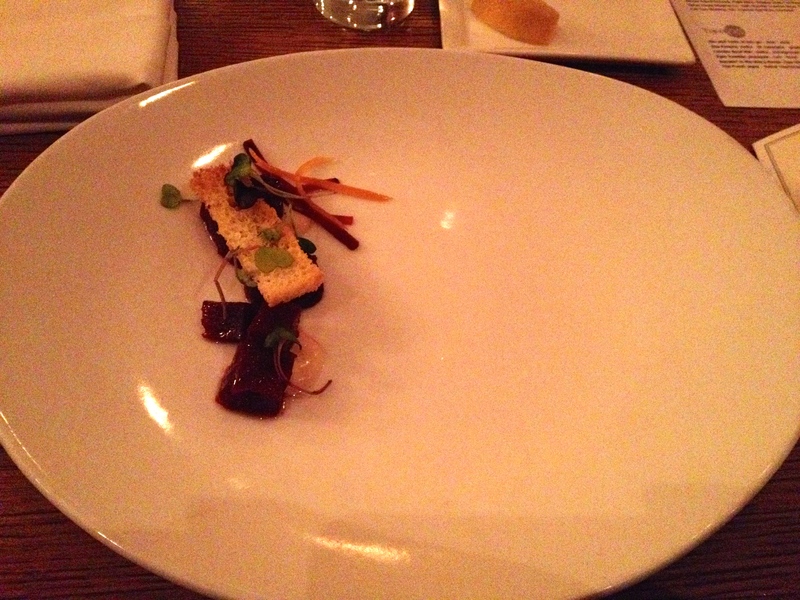 It was not, however, the best plating I’ve had – that would probably go to Sixteen or Blackbird, maybe La Belle Vie. Overall: the food wasn’t worth the money. The experience may have been, although the more I think about it, the less I like it. I’m glad I tried it (at very least so that I learned not to go back without having spent a hundred dollars or more), but I doubt I would again. For the money, I could eat very well at Sumi Robata Bar (my new measurement, apparently) or Frontera Grill. Frankly, it was as very disappointing start to Restaurant Week. 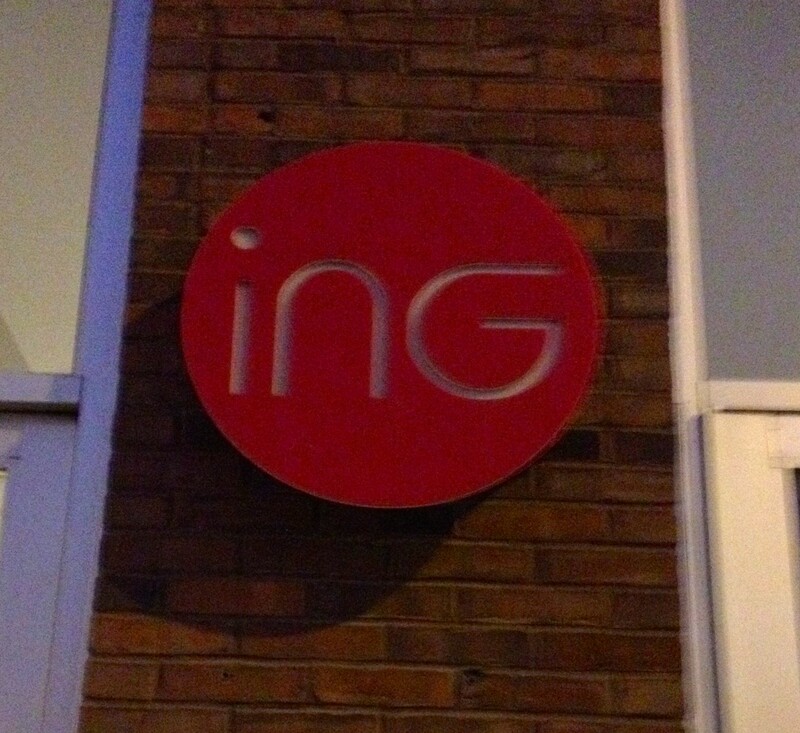 This entry was posted in Chicago, Restaurant and tagged Chicago, Chicago Restaurant Week 2014, iNG, restaurant, review. Bookmark the permalink.